The transition between summer and winter in the Mammoth Lakes area transforms high alpine canyons and lake shores into blazing color. Aspens, willows, and cottonwoods unfold in brilliant hues of yellow, gold, orange and red. 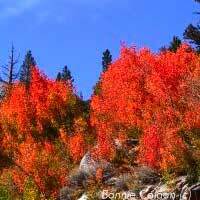 Light and color bathes the scenery from Rock Creek Canyon to the south of Mammoth to Conway Summit to the north. The trees generally begin their annual change early in September offering the best viewing in late September. They come to color and continue through October. Hurry and get up here. There are some great routes to take, including the canyon ride out to Rock Creek Lake and the Mosquito Flats Trailhead. If you go before October 16, stop for some pie at the Rock Creek Lake Resort and tell 'em Jefferson says to have the boysenberry. Beautiful trees in autumn line the highways and mountainside.